Finding your holy grail skin care products isn't easy. With celebrities, friends and the like all having different ideas about what works for their skin, it is physically impossible for one person to test (and purchase) all the products they have been recommended over the years. This is why we’ve done the hard work for you; testing and reviewing the treatments and products everyone is talking about, from the Dyson Airwrap to IT Cosmetics CC Cream to bring you firsthand information (it’s a hard life). The product having it’s skin care moment is the Dermalogica Rapid Reveal Peel, an at-home AHA based peel in 10 individual capsules to be used as a once weekly salon-level treatment. Using AHA extracts, lactic acid and plant enzymes it is intended to exfoliate and accelerate the cell-renewal process, without drying out the skin. bh’s Managing Editor Katie and Skin Care Editor Jordy put the at-home treatment to the test. 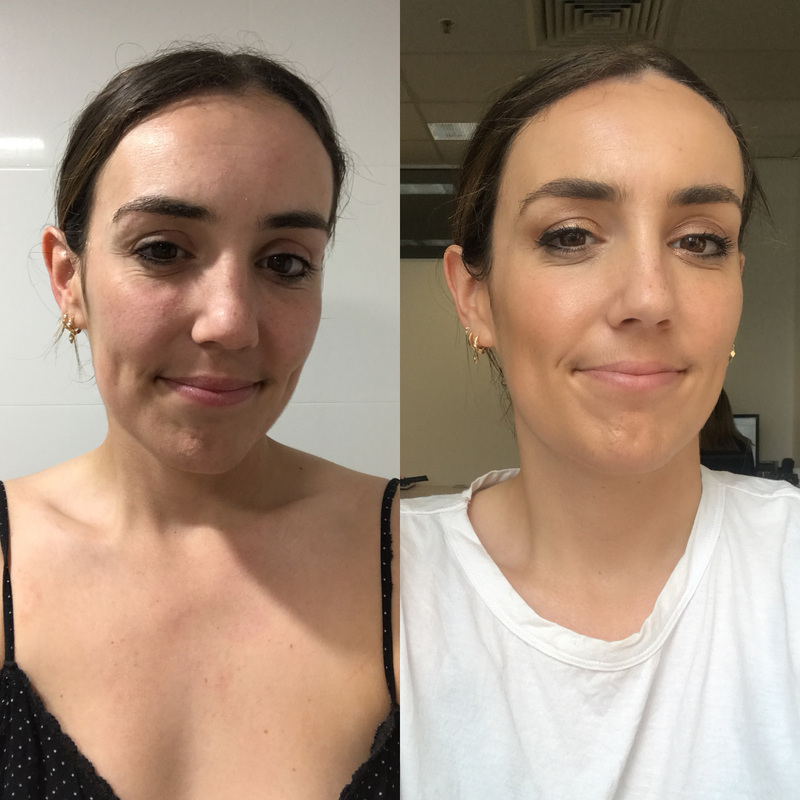 "Until recently I’d never had a facial peel and I jumped at the chance to try Dermalogica’s Pro Power Peel at their Met Centre salon in Sydney. I’d heard amazing things and my expectations were high. The 60-minute treatment is completely customisable to your individual skin concerns. I wanted to target overall dullness, fine lines on my forehead and congestion around my chin area. My therapist started by prepping my skin with the One-Step Prep, then she applied the UltraBright Peel with 30% Lactic Acid to deal with the dullness. The PowerClear Peel was then applied to my chin area to target my blemishes and the Advanced Renewal Peel applied to my forehead which is made up of 30% Glycolic Acid to resurface my skin. A soothing neutraliser was then applied to finish. My skin felt amazing afterwards, and at the three-day mark it started to flake around the nose, chin and forehead, and by day five, I was glowing. I’ve had so many compliments on my skin since. The best bit is that I don’t have to wait for my next peel at the salon to maintain the finished product, as released a version I can use at home. The Dermalogica Rapid Reveal Peel comes in small tubes that can be used weekly, you just need to wait 10 days if you’ve had a Dermalogica’s Pro Power Peel in a salon before you start using it. I’ll definitely be making this a regular part of my skin routine." "I was also lucky enough to experience a Dermalogica Pro Power Peel to kick-start my treatment*.This treatment was less the fluffy, relaxing facial experience and more focused on achieving serious results. After a skin care evaluation, which I talked to my therapist about my major concerns being pigmentation and overall brightness, she developed a mixture of active peels that left my skin feeling fresher and brighter, albeit a little flaky but nothing super noticeable. 10 days after the Pro Power Peel we were advised to start the Dermalogica Rapid Reveal Peel, an at-home kit with individual capsules to be used once a week, to complement and enhance the results of the Pro Power Peel. The formula is meant to be left on for 3-7 minutes and is made up of AHAs, Lactic Acid and plant enzymes to remove surface debris, dull skin and accelerate cell turnover. I have found the individual capsules super easy to use, meaning there is no confusion about how much is too much product (which always crosses my mind with something active). It does feel slightly tingly upon application, however I love this feeling with any product as it means I can feel them working. I don’t have super sensitive skin but my skin has reacted to active formulas in the past. I also consider my skin on the [very] dry end of the spectrum so I was a little concerned about whether or not the peel would make this worse. My verdict: I absolutely love this at-home treatment. Everyone is busy and squeezing in regular salon trips often isn’t possible or affordable. After using the Rapid Reveal Peel my skin is noticeably brighter, more even and along with a few other lifestyle changes I have made (diet and sleep related), I have had fewer blemishes and breakouts than I have ever had in my life. One of my favourite things about this treatment however, is that despite it being an active peel, there is no down time necessary. I experienced a little redness but as it is a treatment intended for nighttime, I always woke up the day after with glowing, happy and not at all red skin. My tip, and I’m sure you’re sick of hearing it from me but if you are using anything active, especially something like a peel that is resurfacing the skin, make sure you are applying at least an SPF30 before you leave the house in the morning (one of my absolute favourite formulas is the Dermalogica Super Sensitive Shield SPF30 for under makeup)." *You can also use 3 of the at-home capsules in 3 days, as opposed to a professional treatment to achieve the same kick-start effect. Only use one every week after that. Do you like the sound of this product? Does it sound like something you would like to try? A good acid treatment always helps rejuvenate the look of my skin. I look forward to seeing some reviews on this peel. These peels sound very interesting. Did you purchase them through RR? If so, how did you find them? No, did not get them at the end. Forgot why. That said, my Neostrata Glycolic Cleanser contains grapefruit extract but I suppose it’s washed off so not as much of an issue? Yes agree 100%, I love to apply face masks, exfoliators, body exfoliators, do my own hair colour, love everything at home, so comforting. Dermalogica facials are so so good. I had the pleasure of getting one and slept like a baby. Would love to try this peel. Was it quite a relaxing facial? deramlogica has never dissapointed me ! Good brand but not convinced it's necessary with skin so sensitive I react to many products and this could be asking for trouble. Great if you could use it. Thanks for your recommendation of this product BH, sounds ideal to me and definitely one that I am busting to try. Have always been impressed with the effective results from Dermalogica products and I have no doubt this will be any different. Cheers. Not sure about this for my sensitive skin. This product certainly appears interesting. I am very sceptical about many products on the market these days and I must admit I never know what to believe. I must look into this one a bit more as it does sound very good. I've been using Dr Dennis Gross peels but umming and ahhing over this new Dermalogica kit. Thanks BH for guinea-pigging it for us! Omg the second pic!! That transformation!